This is a quick, easy and vegetarian version of the Chicken & Corn Chowder we cooked previously which was meant to have some leeks in it. 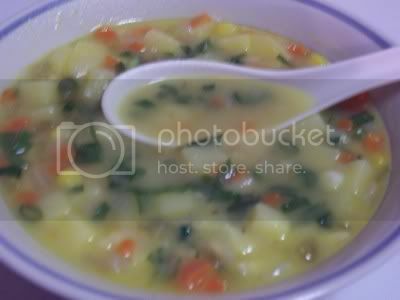 This is the Clone’s new favorite soup because it doesn’t have any meat and it has leeks which she planted herself, so it’s her new favorite vegetable. Start by melting the butter in a hot pan and cooking the flour in it for a couple of minutes. Add the garlic, onions, leeks, carrots, celery, corn and potatoes and let it saute’ until it is fragrant, about 5 minutes. Add the broth and let it simmer for 15-20 minutes or until all the vegetables are tender and the broth has thickened up a bit. Season with salt and pepper and serve.